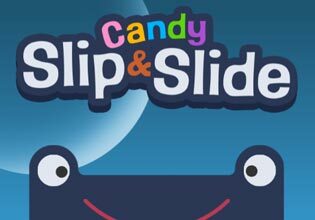 'Candy: Slip and Slide' is the new monstrous puzzle for quick fun! You have to drag colorful candies of various sizes so that they create full rows and disappear. You can't stack more than nine rows. Since new candies appear after each turn, you will need a good matching ability and foresight. Luckily, this friendly monster is here to help you! The more rows of candy you destroy, the hungrier the monster becomes. If the hunger bar is filled, the monster will eat some treats. If you feed the monster certain candies, it will level up, and then it will be able to eat more. If your situation seems hopeless, don't worry! Use one of the power-ups to break candies into smaller pieces, or to eliminate random pieces or treats of a certain color. Play 'Candy: Slip and Slide' now for free and feed your monster row after row of delicious treats.